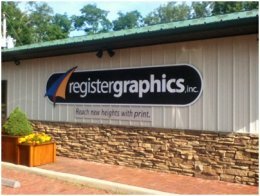 Register Graphics on 220 Main Street in Randolph, New York offers custom commercial printing from large format banners, brochures and posters to custom mailing services. Whether your project needs to be designed from scratch, or you will be providing complete, press-ready digital files, their Graphic Design and Prepress teams can handle it all. Register Graphics values each customer and offers their personal touch to all projects. They offer a wide-array of services and feel privileged to do as much (or as little) as you need them to.